War insgesamt ein nahezu perfektes Hostel. Es gibt nur ein paar Kleinigkeiten zu gemängeln. Mit 6 Frauen auf einem Zimmer hätten wir uns über einen Spiegel gefreut und die Dusche bietet nicht genug Platz, um Sachen abzulegen oder sich umzuziehen. Es ist ein Haken an der Tür, aber die Sachen bzw. Handtücher werden dort beim Duschen schnell nass. Ist dann beim Abtrocknen eher kontraproduktiv. Außerdem hört man abends die Musik aus den umliegenden Clubs und morgens bellen die Hunde mega laut. A little loud in the evening but over all really nice. But socializing is not that easy. Rooms are really huge with curtain for each bed! Nice reception , cozy cinema area and nice pool ! Everything was clean and the location was good but not the best place to get to know other people . It was really good thank you. Near to the sky garden what I recommend, not that loud like expected but if you have eartips it's even better to sleep. 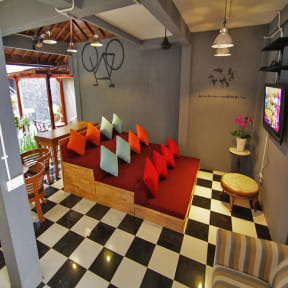 The hostel is located in the center of Kuta. It's clean and you can have your privacy on the toilets as they are entirely closed and always smell nice and cleaned. Would stay there again! The pool area is quite nice and a relaxing place and it’s a good accommodation for one night. In other parts of Bali you get more for what you pay here, but I didn’t expect that much in this touristy area, so it was okay. 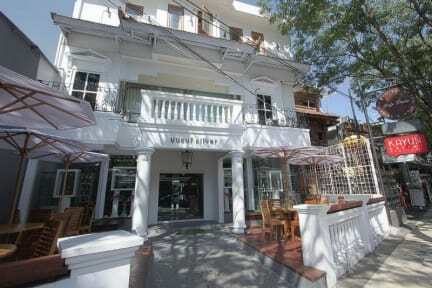 The hostel is in the middle of kuta in the mainstreet. That's good! and it's cheap, but the staff is unfriendly, they don't know the price of anyhting in their Menu and they always call somebody else for that. In the 4 days I spend there my room or the bathroom facilities were not cleaned once! not even the trash bins and my room was already dirty when I entered the room. One guy in my room found a bedbug befor he slept in that bed. Good potential but bad performance.